I have had the privilege to taste some very expensive wines in my life. Now just to be clear, the value I am shamelessly bragging about is not monetary. I am talking about aged wines that you cannot put a price on. These are wines that were bought years ago, and patiently waited for the optimum time before enjoying it with all the right people. Those wines – as well as the experience itself – are priceless. But what if we had to put a price on a bottle? Have you ever wondered what a $4,000 bottle of wine tastes like? How about $20,000, $50,000 or $100,000? I know what you’re thinking… this is just crazy. Well, Australian wine producer Penfolds begs to differ. I present to you the most expensive wine in the world: Cabernet Sauvignon “2004 Block 42”, for the mere price of $168.000! This current-release wine comes from the Barossa Valley, a major wine-producing region and tourist destination of South Australia. Penfolds is a well-established and respected winery. It was founded in 1844 by Christopher Rawson Penfold, an English physician who emigrated to Australia, and his wife, Mary Penfold. It is one of Australia’s oldest wineries and a company brand with an extensive product range. The Cabernet Sauvignon grapes used to make this wine come from a single vineyard comprised of some of the oldest vines in the world. Alright, that’s a pretty good selling argument… what else do they have? The wine isn’t kept in some generic 750 ml wine bottle because that would be just too tacky. Instead, it comes in a sealed glass capsule called an “ampoule”, which is encased in a hand blown conical, elongated plumb-bob of transparent grey glass with a ruby red ‘cotton-reel’ top. The plumb-bob is suspended in a bespoke Jarrah cabinet, with the ampoule held securely at its core. The perfect balance of glass, wood and metal, all of it carefully assembled with extraordinary craftsmanship. The entire structure looks like a prop for a James Cameron sci-fi movie. The result is breathtaking and quite unusual when it comes to wine container. With only 12 handmade vessels in existence, a remarkable short film was made to capture the essence of the Penfolds Ampoule and share the incredible talents of its makers. 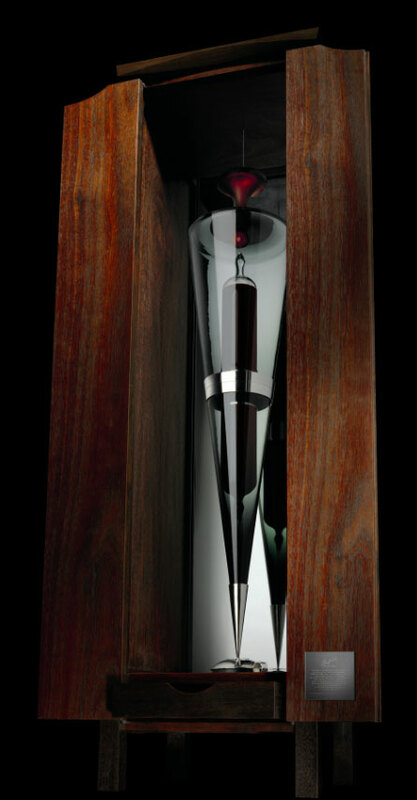 Should you be one of the few to own one of the limited-edition precious wine, a member of the the Penfolds winemaking team will travel to the destination of your choice and ceremoniously open the ampoule using a specially designed tool. The winemaker will then prepare the wine using a beautifully crafted sterling silver tastevin. This specific release is a limited edition and the winery is hoping to get as much as $168.000 per ampoule. With all the billionaires in the world, all so eager to buy the latest and the greatest, this wealthy wine of the hoard is bound to sell for asking price. The wine will be selectively distributed to buyers around the world. The winery cleverly set a high price tag and let the media handle the rest. Penfolds is building a name for itself, renewing global recognition, which will help selling the other wines they produce for the rest of us, the non-billionaire people. 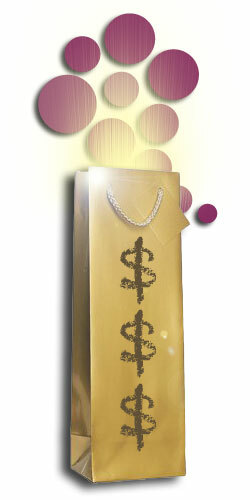 All that said, I will end this post with one simple question… What do you eat with a $168.000 bottle of wine? !